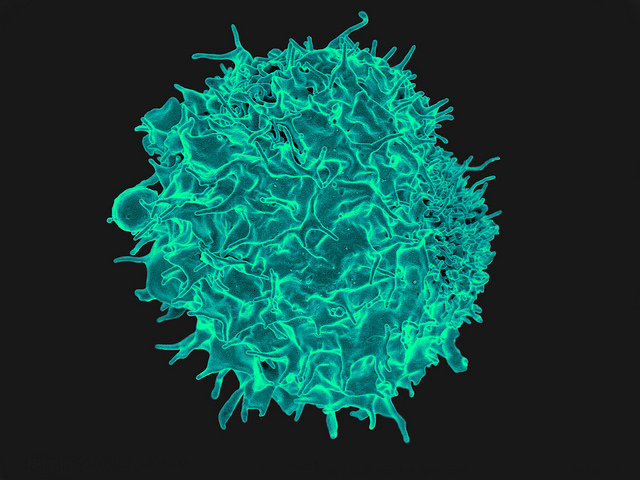 T cell therapies have shown remarkable promise for treating cancer. Specially engineered T cells can target and eliminate some types of B cell cancers, such as lymphoma. But the approach is not a panacea. The T cells sometimes attack healthy tissue. Severe inflammation can result. And solid tumors remain impenetrable. To address these challenges, Kole Roybal, former JCC Fellow with Wendell Lim at the University of California San Francisco, and his colleagues focused on the Notch receptor, which spans the cell membrane. There, it detects signals outside the cell, and then releases a component within the cell, relaying the signal to the cell’s nucleus. “We reasoned that Notch could be a perfect platform on which to build custom environmental sensors that detect disease- or tissue- specific cues and initiate a more streamlined custom therapy,” Royball wrote in Science. “SynNotch receptors essentially allow us to confine the T cell response at the site of disease with the goal of enhancing the ability of the T cell to, for example, overcome the inhospitable microenvironment of a solid tumor. SynNotch engineered T cells are also versatile in that they can either be used drive a potent immune response to cancer or suppress an immune response in an autoimmune setting,” he said. “We can also program these T cells to perform functions that are non-natural. We have shown that T cells can locally produce commercial therapeutics (such as antibodies) in a solid tumor. In principle, we hope to engineer T cells or other cell types to reside in the body long-term and produce therapeutics if they recognize disease or recurrence of disease. This is very much akin to our natural immune system, which is always poised to respond to infection,” said Roybal, who is now an assistant professor at the University of California, San Francisco. Next, he and his colleagues plan to develop more precise cancer targeting by engineering T cells to detect multiple features on diseased cells. “My colleagues and I envision cell therapies that act as microscopic ‘physicians,’ capable of detecting, diagnosing, and directly eradicating disease via a multifaceted mechanism that is difficult to resist and circumvent,” he wrote. Roybal won the Sartorius & Science Award for Regenerative Medicine & Cell Therapy for his essay describing this work.